The compact excavator’s zero-tail swing feature means that the operator does not have to worry about what is to the side or behind. No matter how far the U17 turns, the tail always remains within the width of the tracks. With a breakout force of 1550kg, the U17-3 has the power for heavy loads and tough excavating jobs in tight and enclosed spaces. This is especially good for urban sites. 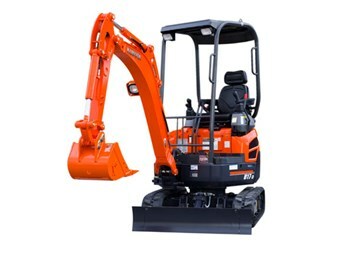 The U17-3 is the latest introduction to the Kubota excavator line-up. The zero tail swing compact excavator delivers power, control and smooth performance. The U17 is an enhancement on the U15 with an improved pump capacity, extended dozer arm and other upgrades available to further increase efficiency and productivity. The U17-3’s zero-tail swing feature means that no matter how far the U17 turns, the tail always remains within the width of the tracks. Zero-tail swing also ensures excellent balance, stability and faster operation, making the U17-3 ideal for jobs in congested urban areas and tight spaces. Kubota has upgraded the engine from 13hp to 17hp, so the U17-3 delivers more power and dependability, low noise and vibration levels, exceptional fuel efficiency, and complies with the EPA’s 2008 Tier IV emissions regulations. The hydraulic pump capacity has been increased to 45 L/min, offering the boost of versatility needed to take on a wide variety of jobs. An extension to the dozer arm to optimise the clearance between the dozer and the bucket makes collecting soil and rocks close to the machine simple and more efficient. The U17-3 offers an enhanced travel motor, resulting in 10 percent traction increase when operating in low speed. Kubota has included bushings throughout the U17-3’s pivot points on the swing bracket for increased durability. The enclosed travel motor hoses within the track frame and front hoses routed within the arm provide added protection and improved visibility, resulting in increased service life and reduced repair costs. With a breakout force of 1550kg, the U17-3 has the power for heavy loads and tough excavating jobs. The U17-3’s excellent reach and digging depth ensure that each digging job is performed with maximum efficiency and speed. The standard fitment deluxe high-back seat increases productivity by providing optimum comfort for operators of all sizes. The two-speed travel switch placed on the dozer lever enables quicker and easier dozing operations. A quick flip of a switch changes operating patterns from ISO to SAE or vice versa. The cylinder design features a larger diameter rod and increased hydraulic pressure for greater lifting power and optimum front attachment speeds. The U17-3 has under-deck hydraulics that can be accessed quickly and easily for routine maintenance. Wide-opening covers provide access to the engine oil gauge, coolant reserve tank and dual element air cleaner. It’s also easy to access the fuel filter and water separator, battery, radiator and oil cooler. Two-piece hose connections for the dozer and boom cylinders simplify hose replacement, reduce downtime, and virtually eliminate the need to enter the machine for maintenance. 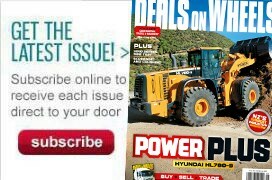 To read in-depth machinery reviews, see the latest issue of Deals on Wheels magazine, on sale now at all good retailers.